Travis Bruton being sworn in as Glenn Heights Place 1 Council Member. 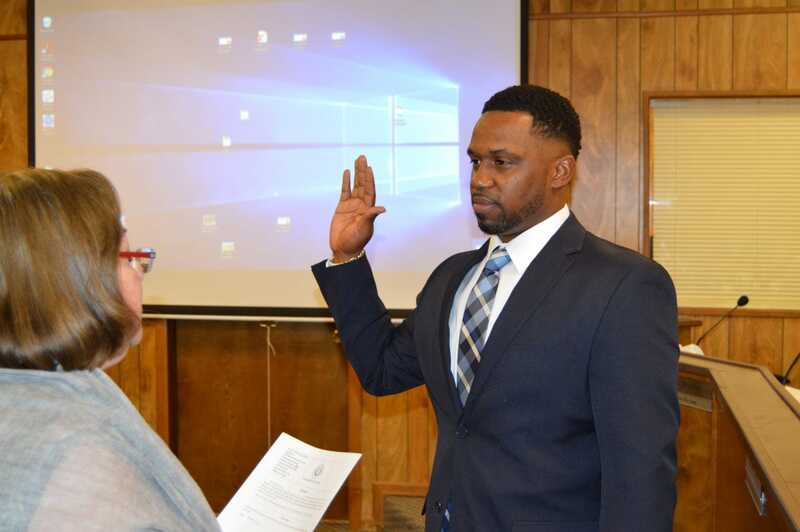 GLENN HEIGHTS—The newest city council addition took the oath of office Tuesday at the bi-monthly meeting. Travis Bruton ran without an opponent for the Place 1 seat in the recent November elections. The Place 1 seat was made vacant after the resignation of Councilman Sidney Davis. City Council Place 1 has a little more than one year remaining in the current term. Bruton will have to run for office again in 2018 if he chooses to remain on the city council. The Glenn Heights City Council also approved the runoff election for the Place 6 seat. Residents will have to opportunity to cast their ballots Tuesday, December 12. All City voters will vote at Glenn Heights City Hall on Election Day and during the Early Voting period in person. Polls will be open between the hours of 7 a.m. and 7 p.m. The two candidates in the runoff election are Jeremy Woods and Machanta Newson. The candidates for Council Member Place 6 received less than a majority of all votes cast, which resulted in the need for a runoff election as required by the city’s Home Rule Charter. Early voting at Glenn Heights City Hall will be between the dates of November 27 and December 8, 2017 during the times listed below. • Monday, November 27 through Friday, December 1, 8:00 a.m. to 5:00 p.m.
• Saturday, December 2, 2017, 8:00 a.m. to 5:00 p.m.
• Sunday, December 3, 1:00 p.m. to 6:00 p.m.
• Monday, December 4 through Wednesday, December 6, 8:00 a.m. to 5:00 p.m.
• Thursday, December 7 through Friday, December 8, 7:00 a.m. to 7:00 p.m.
Canvassing for the December 12 election will be December 19. The city’s first regular city council meeting in 2018 on January 9 will be the date the Place 6 City-Council Member-elect will be sworn in and issued the appropriate certification of election.